The Software University will conduct a free preparatory program for beginners in 38 cities throughout Bulgaria - Asenovgrad, Botevgrad, Blagoevgrad, Burgas, Varna, Veliko Tarnovo, Vidin, Vratsa, Gabrovo, Gorna Oryahovitsa, Dimitrovgrad, Dobrich, Dupnitsa, Kazanlak, Karlovo, Kardzhali, Kyusetndil, Lovech, Montana, Pazardjik, Pernik, Petrich, Pleven, Plovdiv, Razgrad, Rousse, Samokov, Sandanski, Svishtov, Silistra, Sliven, Smolyan, Sofia, Stara Zagora, Troyan, Haskovo, Shumen and Yambol. The course starts on October 6th and is absolutely free. Within two months, students will go through all of the fundamental programming topics, such as variables, data types, conditional constructions, cycles, and more. 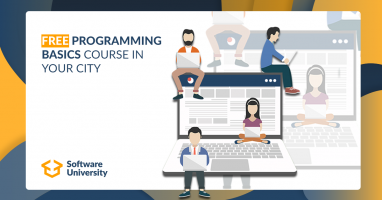 The "Programming Basics" course provides initial programming skills required for all of the technology courses at the Software University and ends with a practical programming exam that is accepted in the software engineering program of the Software University. The course is suitable for anyone with an interest in programming, does not require previous experience and does not set age limits. Those wishing to choose can choose between two forms of education - either attending form of education or online. Applying for the Programming Basics course will last until September 27th.